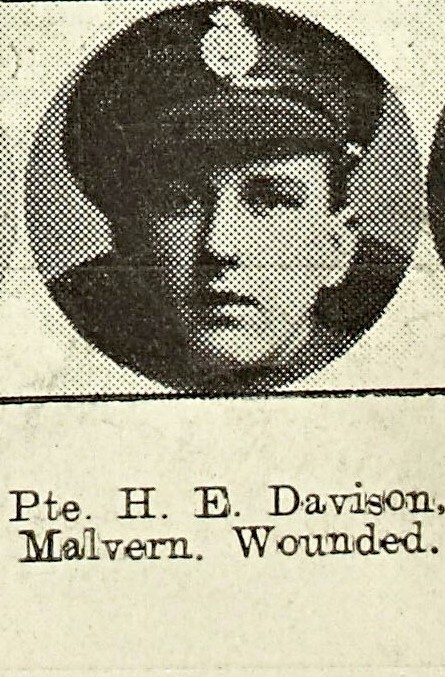 Next of Kin: Elder son of Edwin and Ellen Davison of 2, Meadow Cottages, Court Road, Great Malvern. Herbert Davison was born East Radford, Nottinghamshire, the son of Edwin and Ellen Davison. A member of Christchurch choir, he was apprenticed at the Indo-china Stores, Church Street. He joined the Worcestershire Yeomanry in 1916 at Worcester; but with the general redundancy of mounted troops in most theatres of war, he was transferred to the 1st, later 3rd Worcestershire Regiment. He was wounded on the 22nd March 1918 and was evacuated to a Birmingham Hospital and later was sent to recuperate at the Fairfield Red Cross Hospital at Malvern. Canon Chadwick, Vicar of Christchurch, paid tribute to him in the Christchurch Parish Magazine.